CHICAGO—Female mortgage applicants are less likely to have their loans originated than are male mortgage applicants, Woodstock Institute finds in a new fact sheet. The Institute also found evidence that female-headed joint applications (a female applicant with a male co-applicant) are less likely to have mortgages originated than are male-headed joint applications (a male applicant with a female co-applicant). Female-headed joint applications are much less likely to be originated than are male-headed joint applications. Controlling for loan-to-income ratio, which is one measure of the affordability of the loan, female-headed joint home purchase mortgage applications in the Chicago six county region are 24 percent less likely to have loans originated than are male-headed joint applications. Among subregions in the Chicago six county area, the largest disparities between female- and male-headed joint purchase application originations are in Northwest Cook (female-headed joint applications are 40 percent less likely to be originated), Kane County (40 percent less likely), and Will County (34 percent less likely). Female-headed joint applications are not significantly less likely to be originated than male-headed ones in South and Southwest Cook, DuPage County, Lake County, and McHenry County. The disparity between female- and male-headed joint home purchase applications holds true across all racial categories, controlling for loan-to-income ratio, and is most pronounced for African American women. African American female-headed joint home purchase applications are 34 percent less likely to have loans originated than African American male-headed joint purchase applications. White female-headed joint purchase applications are 22 percent less likely to have loans originated than are white male-headed joint purchase applications, while the disparities between likelihood of origination for female- and male-headed joint purchase applications are 19 percent for Latino applicants and 12 percent for Asian applicants. The racial and gender disparities among joint applications are even more extreme for refinance loans. Controlling for loan-to-income ratio, female-headed joint refinance applications are 39 percent less likely to have loans originated than are male-headed joint refinance applications. Among subregions in the Chicago six county area, the largest disparities between female- and male-headed joint refinance application originations are in Will County (51 percent less likely to be originated), South Cook (50 percent less likely), and Kane County (45 percent less likely). The smallest disparities between originations of female- and male-headed joint refinance applications are found in the City of Chicago (27 percent less likely), Northwest Cook County (27 percent less likely), and North Cook County (29 percent less likely). The disparity between female- and male-headed joint refinance applications is more severe across all racial categories, controlling for loan-to-income ratio, and is most pronounced for African American women. African American female-headed joint refinance applications are 44 percent less likely to have loans originated than are African American male-headed joint refinance applications. 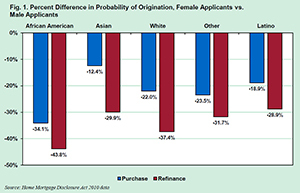 The disparities between likelihood of origination for female- and male-headed joint refinance applications are 37 percent for white borrowers, 30 percent for Asian borrowers, and 29 percent for Latino borrowers. There are overall disparities in lending to women across racial groups. Controlling for loan-to-income ratio, female home purchase applicants are 8 percent less likely to have loans originated than are male home purchase applicants, while women applying for refinance loans are 21 percent less likely to have loans originated than are men applying for refinance loans. The fact sheet concludes with recommendations for effective fair housing enforcement and further investigation into possible gender discrimination in mortgage lending practices. It also recommends that the Consumer Financial Protection Bureau expeditiously finalize enhancements to the Home Mortgage Disclosure Act that will make public more information that would allow for better identification of discriminatory lending practices. “With the finalized HUD disparate impact rule in their toolkit, regulators must ensure that women receive equitable access to mortgage credit,” says Cowan. For more information, contact Spencer Cowan at scowan@woodstockinst.org or 312-368-0310.